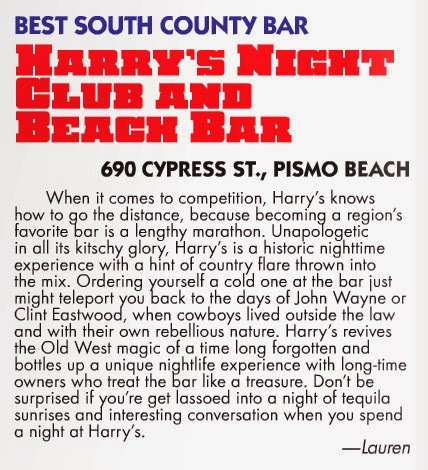 Harry's Night Club & Beach Bar: Harry's Night Club & Beach Bar Awarded #1 Bar in South County AGAIN!!! Harry's Night Club & Beach Bar Awarded #1 Bar in South County AGAIN!!! It’s official! the New Times SLO came out with the Best Of SLO results today!! 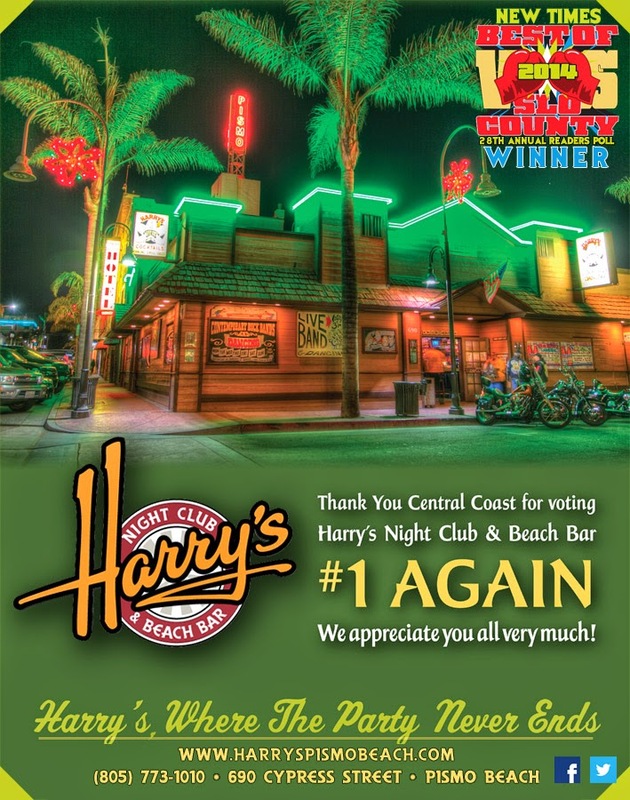 And YOU voted Harry's Night Club & Beach Bar the #1 Bar in South County again!!! We are very proud and excited! We can’t wait to celebrate with you all! Thank you so much! Cheers!!! Foe. Rival. Nemesis. Enemy. Call them what you will, but we’ve all got them, to one extent or another. It might be the guy at work who always steals your lunch, the detective who rats you out to Scotland Yard, the jock who mocks you for playing Magic: The Gathering, or the news station that keeps beating you in your own readers' poll. But at the end of the day, that instinct to compete, to overcome, to win, to best our adversaries is often what drives us to create our best work. Whether that work happens to be a delicious burrito or culinary concoction best found in our Dining Out section; a cold margarita after a long day at work, as identified in After Hours; a theatrical production that will have you laughing or crying, and possibly both, from Arts Scene; an ingeniously crafted bit of bling for your earlobes, pet, or eyes, from the diverse Burnin’ Money section; the best haircut you’ve ever had, as featured in About Town; climbing equipment that will support you during your biggest adventure yet, from the Get Out section; or a politician who will renew, or confirm your lack of, faith in politics, from Community Watch, it’s worth celebrating. So here’s to you, archenemies! Just this once, we’ll drink to your health … once we’re done scouring the After Hours section of Best Of to determine where to go for that drink.